For more than six decades, doctors, nutritionists, and public health officials have been waging a war against high cholesterol in an effort to fight heart disease. It’s a war that has seen the demonization of saturated fats, the rise and fall of hydrogenated oils, and the introduction of several generations of “miracle” drugs. CHOLESTEROL, THE GREAT BLUFF convincingly argues that the link between cholesterol and heart disease is tenuous – and that its persistence results from a potent mix of bad science, entrenched interests, and pharmaceutical profits. The problems date from the earliest days of the cholesterol hypothesis, first proposed by physiologist Ancel Keys, who proposed that a diet high in saturated fight leads to cardiovascular disease. Medical journalist Dr. Dominique Dupagne cites evidence that Keys cherry-picked his data. But it was too late. Americans were trying to understand what lay behind the soaring rate of heart attacks, and fat seemed like the perfect villain. Once saturated fats were to blame, heavily industrialized products such as "pure vegetable shortening"—the result of a process including emulsification, bleaching, and steam-cleaning—come to be seen as healthier foods. As the film makes clear, researchers who made any serious attempt to study other hypotheses—that sugar led to vascular disease, for instance—found themselves threatened, their research funding cut and their careers derailed. 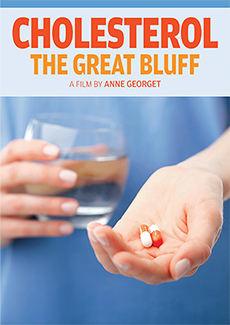 CHOLESTEROL, THE GREAT BLUFF deploys an array of authoritative and engaging experts to attack the foundations of the cholesterol hypothesis. Author and nutritionist Sylvain Duval uses markers and easy-to-understand analogies to explain the mechanisms of how cholesterol works and how the body uses different fats. Investigative journalist Nina Teicholz lays out how Keys came to demonize cholesterol, and details the intimidation faced by those who sought alternatives. Cardiologist and nutritionist Dr. Michel de Lorgeril, who did the first study on the benefits of the Mediterranean diet, is scathing in his views on the pharmaceutical industry’s complicity in propagating faulty research, including the studies that led to the widespread adoption of statins. The film also hears from an array of other researchers, physicians, and writers who, among other things, question the notion of "good" and "bad" cholesterol. Every year, tens of thousands of Americans die as a result of medical mistakes.